Giraffes, elves, genies, and dumplings, oh my! Emojipedia released a new, comprehensive list last Thursday of emojis expected to be released June 30 of this year. Of course, the date is subject to change, the site specifies, as are the emojis. But what's important is there are many updates in the bunch that will fill painful gaps in the 2017 emoji space. By which I mean there are set to be mermaids and breastfeeding emojis. Not only are there mermaids in the update though, there are also mermen! And vampires and elves and genies and zombies and mages! All of the aforementioned magical beings will be available in two genders and five skin tones. As far as humans go, Emoji 5.0 will include people in steam rooms, people climbing, people in headscarves, people with beards, old people, and people in lotus position in addition to the breast-feeders. Oh, and there will be a human brain. As for animals? There will be dino additions and a giraffe, thank goodness. If you've only been reading this long to hear about food, I'm sorry, and you won’t be disappointed: DUMPLINGS. I repeat—you will soon have lil emoji dumplings. 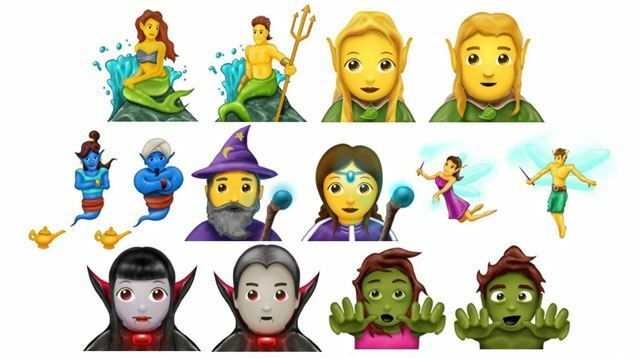 Read the list of updates, see the mock-ups of the emoji in full here, and look forward to a time where you will soon not have to stress over not being able to express your true mermaid or dumpling self.